Most of us would rather remove fine scratches than hide them, but consider this: every time you compound, you are removing tiny amounts of clear coat in order to level scratches. Because there is a finite amount of paint on your vehicle, you’re better off putting off paint correction until there’s a real need for it. For minor scratches and fine swirls, you have another option: Griot’s Garage Paint Glaze. At Autogeek, we always say, “Use the least aggressive approach that will work.” Sometimes that means opting for a glaze rather than a swirl remover. 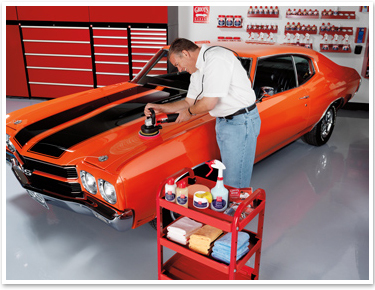 Griot’s Garage Paint Glaze is formulated to discreetly hide those minor scratches and swirls so you still get the appearance of perfect paint. It’s a great option for older vehicles when you’re trying to preserve the original finish or to put off a full detail until you have time. Griot’s Garage Paint Glaze contains premium oils and fillers that hide swirls and light scratches while enhancing the overall look of the paint. Layer the glaze for better coverage. Even as you’re filling in the low points in the paint, the overall finish will appear clear and bright. When small blemishes appear on your otherwise perfect finish, use Griot’s Garage Paint Glaze to hide them until it’s time to polish.